A council of mosques in Lancashire has accused its local government of providing illegitimate halal meat to local Muslim schoolchildren. The LCM described how the schools of Lancashire fell into four categories where halal certification was concerned. It said there were those schools certified by the Halal Monitoring Committee (HMC); contracted by the Lancashire County Commercial Services (LCCS); self-managed; or under contract with the Local Education Partnership (LEP). According to LCM chair Salim Mulla, only schools providing meat certified by the HMC can say the meat is halal, meaning Muslim children can eat meat at those schools. However, on further investigation, MeatInfo.co.uk discovered that none of the food served by LCC schools was certified by the HMC, rather a mix of several agencies, including the Universal Halal Agency (UHA), the Halal Food Authority (HFA), the European Halal Development Board Agency (EHDA) and the Halal Authority Board (HAB). County councillor Geoff Driver, who is leader of LCC, told MeatInfo.co.uk: “It is disappointing that LCM should make these misleading claims. President of the HFA Khawaya Mahsood explained that what is halal was not dictated by any organisation, rather the Quran and the laws in Britain relating to the legal slaughter of animals – the Welfare of Animals Regulation. Glendale Foods supplies halal meat products to Lancashire schools and is accredited by the HAB. Glendale Foods technical director Stuart Newman said: “The issue with halal is that [the certifiers] are all companies that have set themselves up and ask for different things. This issue illustrates the inherent problems that occur when the Halal sector is left as an unregulated sub-sector of the UK food industry. Among the 1.7 billion Muslims around the world there are many interpretations of what is considered to be Halal. Different Halal certification agencies have a tendency to claim that their interpretation is correct, and others are not. It is often used a a ‘USP’ or unique selling point when promoting their own certification services. 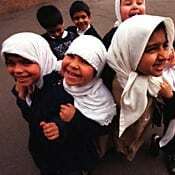 LONDON – An umbrella Muslim group has accused the local government of the British county of Lancashire of providing pupils with illegitimate halal meat, calling for boycotting the food. “The county council should pick suppliers who are accredited to the Lancashire Council of Mosques,” Hanif Dudhwala, of the Lancashire Council of Mosques (LCM), told the BBC News Online on Thursday, November 29. It sent letters to Muslim parents in Lancashire, urging them to prevent their children from eating food at their schools.The LCM says food provided to Muslim pupils does not meet the halal standards set by the council. “Suppliers of halal products are not accredited by any halal certifying organization that is in line with the halal criteria adopted by the LCM,” one letter says. The LCM said that school suppliers do not meet their Halal criteria for meat killed in line with Islamic tenets. “We strongly feel that Lancashire County Council is doing a great injustice to the Muslim community and young Muslim children by feeding them meat and chicken which have not been endorsed by the LCM,” the council said in a statement. But the local government defended its position of providing meat to school pupils. “We are 100 percent certain that our new suppliers will provide fully-accredited Halal food that meets stringent food safety standards,” county council leader Geoff Driver said. He argued that the council would not use suppliers who do not stun animals before slaughtering. “This is acceptable to Muslims in the rest of the country and I am really, really sorry if the Lancashire Council of Mosques won’t accept that,” he said. “We understand from the Food Standards Agency, which consults with national Muslim bodies, that there are a number of acceptable Halal certifying agencies. Halal slaughter has been the subject of controversy in several European countries, where pro-animal groups seek to ban the ritual slaughter on grounds that it causes unnecessary pain to the animal. The current laws in Britain allow slaughtering animals without prior stunning to enable Jewish people and Muslims to meet the dietary requirements of their faiths. Khawaya Mahsood, President of LCM’s Halal Food Authority, said halal slaughter is dictated by the Qur’an and British laws. “It’s only a group of people on their own sitting down making the law, which is against the spirit of British law and that of Muslim law,” he said. Britain has a Muslim community of nearly 2.5 million. Muslim children in Lancashire are being urged to boycott meat provided for their school dinners. The Lancashire Council of Mosques (LCM) said the latest school suppliers do not meet their Halal “criteria” for meat killed in line with Islamic tenets. He added the council of mosques set its criteria for Halal after consultation with Lancashire Islamic scholars. The council ended its contract with the previous supplier after an inspection by its food standards department. The LCM is urging Muslim parents not to allow their children to eat meat and chicken at schools that are supplied with meals from the county council. But, Mr Driver said the council would not use suppliers who did not stun the animals before slaughtering. He said it was “unacceptable” to use meat from animals which had not been stunned. “This is non-negotiable,” he added.